What happens when a creature with a trigger changes control? How do reins of power and homeward path interact? I have a yidris chaos deck that is hands down the most fun deck I have ever played. Have you considered: Yidris, Maelstrom Wielder , Shared Fate , Storm Cauldron and Burgeoning , Havoc Festival , Choice of Damnations , Timesifter , Sands of Time , or Master of Predicaments ? 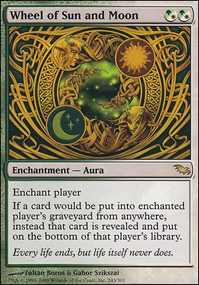 I have never had great luck with Wild Evocation , it usually acts as a more group hug card than chaos. I would try Elkin Lair . If you want a chaotic wincon, Reins of Power has never failed to disappoint. hkhssweiss, you are totally correct about Circuitous Route . I was planning to throw in guildgates in it, but that will be a massive tempo loss, so I took them out and forgot about circuitous route. Took it out for Draining Whelk (though I feel like Perplexing Chimera might be simply better since it makes opponent think twice before casting anything), and took out Sight of the Scalelords in favor of Reins of Power . Yeah you can go with that swap it is pretty weak, you can also consider taking out Circuitous Route as well as Evolutionary Leap as you are running a lot of ramp in the form of artifacts and those are on the weaker side of the ramp as well as you aren't really running much recursion to abuse the leap or tokens to free sac. Sight for Reins of Power is also a good swap. I decided to go creature counterspell path for now, since they can be surprise blockers as well, need they be. I removed Bane of Progress , since I use a lot of enchantments, and he will hurt me too much, and Pattern of Rebirth . Maybe I need to remove Evolutionary Leap as well, not really sure. Added Mystic Snake , Frilled Mystic , Deadeye Navigator and now I need to remove 2 more to fit in Draining Whelk and Perplexing Chimera . Maybe I should switch Sight of the Scalelords with Reins of Power ? It's the reason I chose not to run infinite combos in my Meren deck, that's my deck whenever I play with new people. Going in response with your thoughts, since you are a creature heavy build. 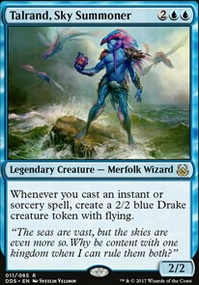 A budget option for reuseable counterspell package is Deadeye Navigator . 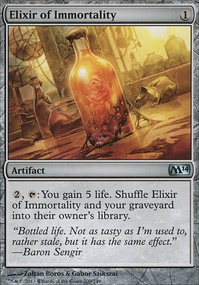 That paired with Mystic Snake or Frilled Mystic makes it retain it's value. 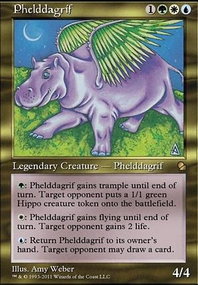 Not only that you can use other cards like Perplexing Chimera or Draining Whelk for more beats and have a good board state. 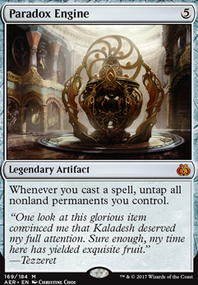 Teferi is good for protection and will be able to lockdown the board and protect more of your stuff, so I would say go for it. If going for a counterspell package the list I would use is only the most efficient ones as I listed before. But also yeah Reins of Power is also great since it doesn't target, which makes it hilarious as hell. No problem goldlion! You know your meta the best! Yeah the meta I come from is super high paced and competitive so everything that comes in mind is all about efficiency, disruption, and protection. In regards to your response, as I said earlier you know your meta the best, I personally don't like one time use effects for long term board state as I like the reuseability of an effect more than burst advantage unless the burst advantage gives an overwhelming board state. I see your reasoning behind most of the cards I selected to consider taking out. If you are worried about indestructible and hexproof creatures, luckily enough we do have answers for them. If they aren't hexproof here are a couple suggestions. Now for the hexproof creatures, well we only have a couple ways to deal with them. First and foremost is mass bouncing like Evacuation , another way to deal with them is to use cards similar to Reins of Power to steal their creatures and than get rid of them. The alternative way is to run effects like Arcane Lighthouse to make them lose their hexproof so that you can target them with removals. Other than those the only way is countering them, but since you are only able to run three of them that is a low percentage. 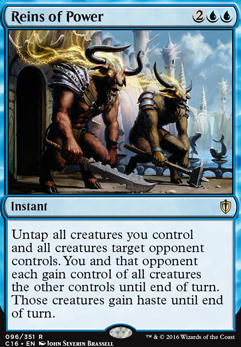 For your shuffle effect since you are gaining a lot of mana, it's not really a budget option but the Eldrazi's are an option to prevent yourself from milling out or reusing cards again. I would recommend Kozilek, Butcher of Truth as he provides CA as well as shuffle effect. 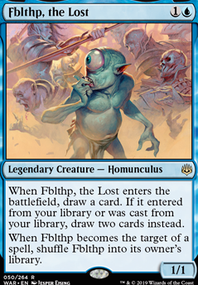 Now for the next part... Prophet of Kruphix is broken, since you are able to play with it again. Use her to your heart's content. It is why I said it will be beautiful with Deadeye, you can use more effects that abuse ETB or LTB triggers. Cards like Mystic Snake will gain more value and be able to be reuseable as long you have open mana. Slithermuse also is fun this way in conjunction with your Psychosis Crawler . The worrying part on your curve also wouldn't matter as 6 CMC for a card that does give you advantage shouldn't matter as also you have access to flash from two sources and you also play in a slower meta. Lastly, Pemmin's Aura is an absolute house imo. Giving it protection as well as pump and tap/untap abilities all on one cards is pretty bonkers. 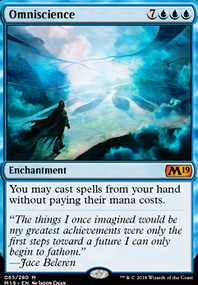 The thing I love about it the most is that it gives your creature shroud on demand, and if your opponents have multiple kill spells you can also in response activate it as many times to protect itself.